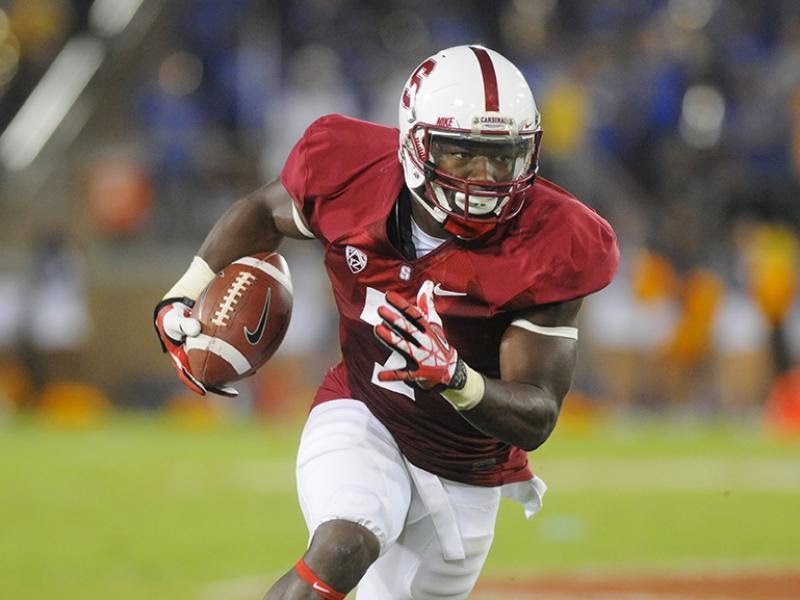 Stanford needs to replace some big names on both sides of the ball, but all-purpose threat Ty Montgomery should have the Cardinal in the mix for another Pac 12 championship. When debating the best conference in college football over the last decade, the conversation pretty much started and ended with the SEC. But, thanks to some dramatic developments out west, the Pac 12 (formerly 10) enters the fray this season. The conference finished 2013 with two teams (Stanford and Oregon) ranked in the Top-5 of Jeff Sagarin's postseason computer rankings, and boasted seven teams ranked in Sagarin's final Top-25. That's one more than the mighty SEC, for those of you keeping track at home, and the Pac 12 finished an astounding 31-6 in non-conference play. If you're wondering, Sagarin already pegged the Pac 12 as the best conference in college football last season (most computer models seem to agree), though he listed the SEC West as the strongest division in the country. With those same seven ranked teams coming off 8-win seasons or better, and only Cal looking like a lost cause, the Pac 12 may be the nation's deepest conference, and (depending on who you ask) features between two and four national title contenders. With tons of Nike money, plenty of speed and even more neon, the Oregon Ducks have transformed from also-ran to national power over the last 10 years, while Stanford has taken a slightly different approach. With a powerful defense and running game, the Cardinal are a true throwback. Former coach Jim Harbaugh laid a rock solid foundation that David Shaw has continued to build upon, and suddenly national title aspirations aren't so crazy in Palo Alto. The Pac 12 as a whole has been powered by superior quarterback play in recent years. From Andrew Luck's days at Stanford to Marcus Mariota's thus far sensational career at Oregon, no conference can match the Pac 12 when it comes to recent signal callers. If you want to win in this conference, you need a great quarterback, and UCLA's Brett Hundley fits the bill. Entering his third year starting for the Bruins, Hundley is the major reason folks around the country think UCLA could have its best team since the mid-80s. With a rocket arm and surprising athleticism, Hundley can do it all, but can he put it all together with expectations so high? But this conference is far more than three powers. Washington and USC both appear to have coaching upgrades, with Steve Sarkisian leaving the Huskies for LA, only to be replaced by former Boise State coach Chris Petersen. Mike Leach has made Washington State watchable again, leading the Cougars to their first bowl in a decade last season, and Rich Rodriguez may have his best team yet at Arizona. Both Colorado and Utah took baby steps back toward respectability in 2013, and Oregon State appears to be back to its winning ways under coach Mike Riley. With so many intriguing story lines and so much talent, there's a lot to dissect in the Pac 12. So, let's get right to it. Oregon didn't appear to miss a beat in coach Mark Helfrich's first season replacing offensive innovator Chip Kelly. That is, until Heisman candidate quarterback Marcus Mariota injured his knee in a route of UCLA. After that, the then-No. 2 Ducks lost two of their next three with Mariota in a brace, dropping them to No. 12 in the pre-bowl polls, and ending a streak of four straight BCS bowl appearances. With Mariota back and healthy, one of the best offensive lines in the country, and a plethora of speedy backs and receivers, look for Oregon to again light up scoreboards across the conference. But how far the Ducks can go will largely depend on Mariota's health and the development of an athletic, but inexperienced defense. Ike Ekpre-Olomu is a legitimate shutdown corner and linebacker Derrick Malone is a tackling machine, but only three other starters return for the Ducks on that side of the ball. More on one of them later. There's a lot to like about the 2014 Cardinal, but also reason to believe that David Shaw's group may take a step back. Other than the obvious strengthening of the conference as a whole, Stanford loses some incredibly productive players on both sides of the ball. The defense loses instinctual play maker and emotional leader Shane Skov, along with with backfield occupying linemen Trent Murphy (led Pac 12 with 15 sacks) and Josh Mauro. Offensively, the loss of Tyler Gaffney and his 1,750 yards will loom large, as will the fact that the Cardinal figure to start a pair of sophomores on a line that returns just two starters and features no seniors. But let's be honest, you still don't want to play Stanford this year. Not with do-it-all receiver, "space player" and kick returner Ty Montgomery and his over 2,000 all purpose yards returning. The Cardinal also have some pretty good bloodlines returning in the backfield, as sophomore Barry Sanders Jr. may start after a year of primarily handling punt returns. Plus, if there's one thing they've been able to build in Palo Alto lately, it's offensive linemen, so youth up front shouldn't be too much of a problem. The defense, though returning only five starters, should still be fine. The Cardinal have been as good as anybody this side of Tuscaloosa running the 3-4, and inside linebacker A.J. Tarpley returns for his senior year looking to make a statement. This team, it seems, will go as far as junior quarterback Kevin Hogan can carry it. Many gave Hogan grief last year, simply because he wasn't Andrew Luck, but the big dual-threat settled in nicely, posting a 20/10 TD to INT ratio, and finishing fourth in the conference in pass efficiency. He'll need to take another step as the Cardinal lose play makers on both sides of the ball, but Stanford will be there at the end, like they have been the last four seasons. Speaking of great quarterbacks, did you realize that Oregon State's Sean Mannion actually led the conference with 4,662 passing yards? It's true, and nobody started the year hotter than Mannion, who averaged 430 yards per game with 29 touchdowns and only three interceptions in Oregon State's first seven games. The final six? Well, they didn't go quite as well. The Beavers dropped five in a row against the meat of their schedule (Stanford, USC, ASU, Washington and Oregon) before rebounding to defeat coach-less Boise State in the Hawaii Bowl. Over those last six games, Mannion threw just eight touchdowns and a dreadful 12 interceptions. Mannion should be more consistent this year, despite the loss of star receiver Brandin Cooks to the NFL. The Beavers return their next four leading receivers, along with three starters along the offensive line, plus a pair of upperclassmen that played sparingly last season. One of the few teams that employ two tight ends regularly, Oregon State also brings back starters Connor Hamlett and Caleb Smith. The biggest question on defense will be pass rushing, as the Beavers return nobody that had more than two sacks a season ago. Still, with seven starters and numerous other contributors returning throughout the field, Oregon State's defense should be a much improved unit. As surprising as it is to think Mannion led the conference in passing yards, it may be even more shocking to discover that Washington State's Connor Halliday was right behind him with 4,597. That is, until you remember that Halliday's coach is Air Raid guru Mike Leach, and that throwing the ball all over the field is kind of what he does. The Cougars return not only Halliday, but also ALL FOUR starting receivers, and 10 of the 11 players that made a catch on one of the country's best passing offenses a season ago. So, they'll be able to throw it, but will they be able to stop anybody? Last season the Cougars ranked 10th or worst in every relevant defensive category in the Pac 12, and lose both of their leading tacklers from 2013. Disruptive middle linebacker Darryl Monroe returns for his junior season, and all three starters return along the defensive line. The major question will be the secondary, where three new starters must be broken in. Though, considering WSU surrendered over 300 yards per game on nearly 62 percent passing in conference match ups, some new blood back there couldn't hurt. When Steve Sarkisian took over as Huskies coach in 2009, the program was coming off a winless campaign and had never been lower. After winning five games in his first year, Sark led Washington to four straight winning seasons and bowl appearances. New coach Chris Petersen also knows a little something about building a program. After turning Boise State from forgettable mid-major to BCS buster, Petersen will now see if he can build a major conference program into a title contender. With seven starters back on each side of the ball, the cupboard is far from bare, but the losses of star quarterback Keith Price and 2,000 total yard back Bishop Sankey leave gaping holes in the offense. Petersen has won with less talented offenses before, but a lack of experience means he will need to quickly coach up this group, led by junior receiver Jaydon Mickens and expected starting quarterback Cyler Miles, a highly regarded sophomore. Defensively, the Huskies should be strong up front. With nose tackle Danny Shelton and end Hau'oli Kikaha (returning conference sack leader with 13 last year) drawing All American hype, it certainly won't be easy to run, or protect your quarterback against Washington. Outside linebacker Shaq Thompson does a little bit of everything, but the largely rebuilt secondary could present some problems. The talent is there for Petersen to have a very successful first season at Washington, but he will have to do it without any proven play makers on offense, or an experienced quarterback. Still, it's not like he hasn't done it before. The Huskies being ranked this low really speaks to the depth of the Pac 12 North, and the faith I have in both Mannion and Halliday to be even better in 2014. Sonny Dykes' first season in Berkeley went about as poorly as it could have. The Bears' only win of the season came against FCS Portland State, and that was a 37-30 squeaker (a game they were favored to win by 27). 10 consecutive losses followed, and Cal was outscored by nearly 300 points in its nine conference games. In year two, the Bears should be improved, but it would take just short of a miracle for them to sniff a bowl in the loaded Pac 12 North. Non-conference games at Northwestern and home against BYU won't help, and the Bears also draw USC and UCLA out of the South. Basically, this is the least user-friendly schedule in the conference (maybe the country), and Dykes must navigate it without much talent. But he does have experience. With nine starters returning on offense, including quarterback Jared Goff, who was a bright spot last season as a freshman, the Bears should improve upon their 19 points per game in conference play. Defensively, Cal returns its top six tacklers, but no true play makers. Expect another long year in Berkley. The team may improve, but its win total might not given the brutal schedule. Getting to three wins would be a huge accomplishment for Dykes and his staff. The Trojans finished last year on a high note, winning seven of their last nine, including an upset of then-No. 5 Stanford, after the dismissal of coach Lane Kiffin in week five. Ed Orgeron did a fine job as interim coach, but the school ultimately decided to hire Steve Sarkisian, fresh off his revival of the Washington program. Sarkisian will have experience at quarterback to work with, as junior Cody Kessler returns after a solid finish to 2013. The Trojans also return running backs Javorious Allen and Tre Madden, both of whom carried the ball at least 135 times last season and boasted averages of over 5 yards per carry. Leading receiver Nelson Agholor also returns on the outside. Defensively, this looks like a traditional USC squad. The Trojans are loaded up front, with All American candidates Antwaun Woods and Leonard Williams anchoring the line, and Hayes Pullard tying together the linebacker corps. Safety Su'a Cravens has a ton of range, and corner Josh Shaw excels when baiting quarterbacks in zone coverage. You don't have to squint too hard to see this team contending for a conference or national title in Sarkisian's first year, but Kessler will have to take a major step forward, and they'll have to out-gun the next team on our list just to make it out of the South. Quarterback Brett Hundley and the offense should be plenty good, with nine starters returning on that side of the ball, and eight starters coming back from a top-half defense certainly bodes well for the Bruins in 2014. Still, depth is a major concern, particularly along both lines. If there is any team in the conference that is one or two injuries away from falling far from contention, UCLA is it. That said, if the Bruins remain healthy in the trenches, Hundley will get five of his six leading receivers back, and the running back duo of Paul Perkins and Jordan James should help him shoulder the rushing load (Hundley led the Bruins with 970 yards on 160 carries last season). Defensively, the loss of Anthony Barr and his 10 sacks will hurt, but there is speed aplenty in the back seven. Middle linebacker Eric Kendricks is a true sideline-to-sideline player maker, but plenty of other young guys will have to step up if UCLA is to again excel on defense. If UCLA finds a new top pass rusher and stays healthy, the sky is the limit. This is your "fingers crossed" national title sleeper. The Wildcats return seven starters on offense, but will be facing a total overhaul in the backfield. That wouldn't seem to be a problem, as coach Rich Rodriguez has manufactured versatile backs and dual-threat quarterbacks everywhere he's gone. Still, replacing Ka'Deem Carey's 1,931 yards won't be easy. But the offense should be plenty potent, with upgrades at receiver across the board. Sophomore Nate Phillips is coming off a huge bowl game, and sophomore transfers DaVonte Neal and Cayleb Jones may each start in week one. Four starters return from one of the conference's best offensive lines, including bruising tackle Mickey Baucus. The defense is young, but after last year's unit returned 11 starters and disappointed, that could be a good thing. Plus, come on, this is a Rich Rod coached team. They're gonna run the 3-3-5 and cause just enough turnovers to win each game 45-42. The Sun Devils were +15 in the turnover department and boasted the conference's third-best scoring defense in 2013. ASU will return star quarterback Taylor Kelly, a player with the potential to steal a few games on his own, but replacing nine starters on that vaunted defense, including three different players with at least 10 TFL, might be too much to ask. Arizona State should score enough points to contend, but expect the defense to take a major step back and the turnover margin to regress closer to even. This still has the look of a bowl team, but the disruptive front of the Sun Devil defense is what made them special and allowed them to make a remarkable run to the Pac 12 title game a year ago. They simply don't have that this year. Quarterback Travis Wilson and star receiver Dres Anderson return for the Utes, hoping to help the program rebound from two bowl-less seasons since joining the Pac 12. Wilson has a live arm and great mobility, but his 16 interceptions were a major reason Utah finished with an abysmal -9 turnover differential. Cutting down on turnovers will be the first priority. Wilson's added experience should help the offense do just that, while adding an element of explosion. On the other side of the ball, defensive end Nate Orchard should again keep the Utes competitive, while the conference's premier pair of specialists, kicker Andy Phillips and punter Tom Hackett, allow Utah to win the field position battle. It's hard to see Utah making any serious noise this year, but natural growth on both sides of the ball, plus elite special teams, should help them again contend for a bowl. The only problem will be a brutal schedule, which brings the Utes games against Stanford and Oregon out of the North, plus pits them against Michigan and Fresno State in the non-conference. It may not seem like it, but Mike MacIntyre did an excellent job in his first season with the Buffs. Squeezing four wins out of a team that only won one and lost to Sacramento State in 2012 was no small task. The return of sophomore quarterback Sefo Liufau will give the offense a chance, but if the Colorado line and backs can't muster more than the 3.4 yards per carry they managed last year, further progress could be slow. Things aren't quite as bleak as they are in Berkeley, but with the Pac 12's nine-game conference slate, you cannot simply schedule your way to a bowl the same way you can in, say, The Big Ten. Colorado is moving the needle in the right direction, but it might be another year or two before the Buffs are back in the postseason. Montgomery may be the best kick returner in college football, and his impact as a threat on offense cannot be overstated. As a receiver, he's one of the best in the Pac 12, but look for the Cardinal to utilize him more in the run game this year, whether it be on jet sweep options, or with him simply lining up in the backfield occasionally. The multipurpose weapon has scary speed, and if David Shaw and his coaching staff can harness it, they could make up for a loss of play makers and shoot the Cardinal back into a major bowl, or better yet, the first College Football Playoff. We've already discussed the fantastic quarterbacks throughout the conference, so it stands to reason that whichever team can rush the passer will have an added edge. Enter Washington, and undersized, but athletic pass rusher entering his senior season. After piling up 7.5 sacks and 12 TFL last season, numbers similar to the best season from 1st round pick Dion Jordan, whom he replaced, the speedy Washington should serve as the perfect complement to massive end DeForrest Buckner (6'7'', 290 lbs) on the strong side. If Washington takes the next step and delivers double digit sacks, it could go a long way toward creating a championship defense in Eugene. Jeremy knows far less about college football than he does pro football, which is saying something, because he's not that great with the NFL either. But he has decided to stop by to add his take on each of this year's conferences. You can debate which conference is the strongest all you want, but the numbers don't lie. As Joe mentioned above, the Pac-12 posted more teams in the final computer rankings than the SEC did (to hell with the subjective Coaches Poll), and the Pac-12 finished with a better non-conference record than the SEC did. What Joe didn't mention is that the Pac-12 also outpaced the SEC in Simple Rating System (one of my pet favorite metrics that combines average scoring margin and strength of schedule). As it turns out, the Pac-12 actually played a tougher schedule than the SEC did last year - the average Pac-12 opponent was 7.01 points better than the nation's average, while the SEC's average opponent was only 5.91 points better. That tougher schedule bumped the Pac-12's SRS score up to +10.49, higher than the SEC's +10.43. Will the Pac-12 be better than the SEC again this year? That's obviously impossible to predict with any certainty. But Oregon and Stanford will again be national powers. USC should bounce back due to an optimistic lack of Lane Kiffin. Arizona State is returning most of their offense. UCLA is returning most of theirs as well. Washington was a strong team last year and added one of the nation's best coaches, while Arizona (Rich Rodriguez) and Washington State (Mike Leach) both have coaches who have shown they can pilot major-bowl level teams when they have the right talent. Only Cal and Colorado could be seen as pushovers, and they aren't any worse than Arkansas or Kentucky from the SEC (something tells me Arkansas and Kentucky were happy to play Samford, Louisiana-Lafayette, and Alabama State in non-conference play, as opposed to Ohio State and Northwestern like Cal did). The Pac-12 might not have the allure of the SEC, but from top to bottom, the conference is just as strong.